Alpha Niche Blogger Template is a clean, simple and fast loading blogger template, It is highly customizable and has responsive layout so that it can fit into any screen size. You can use this template for any niche like tech, Blogging, Events, Authority, Blogging Resources, News, Latest Trends etc. We have optimized this template according to google latest search algorithms so that it will perform outstanding in search result ranking and will boost your blog traffic to its highest peak. The customization process of this template is so easy that you can create your own color scheme in seconds. 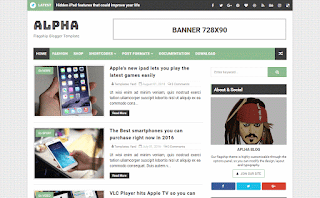 The template is very fast loading and one of the best seo optimized blogger template we have in our directory. Alpha is loaded with lots of professional and useful widgets like Newsticker, Popular Post, Multilevel Dropdown Menu, Email Subscription and many more. You will love it because Alpha has all what you need to build a perfect blog.